Easy Shower Benches are made of light weight, high density polystyrene and are waterproof as well as mold and mildew resistant. The shower benches come in a variety of shapes and sizes and are ready to be tiled by you with whatever tiles you desire. You can tile the top seat area yourself or purchase a pre-cut white marble or travertine seat top. Having been in the construction business since 1965, we have many years of experience working with natural stone, including granite, quartz, travertine and marble. 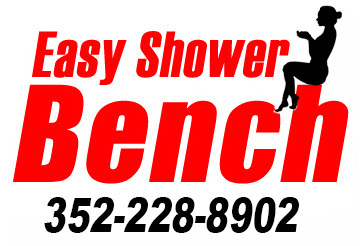 Let the experts at Easy Shower Benches help you find the perfect bench for your shower. Thank you for taking the time to visit us. We strive to make every experience an enjoyable one, and are always more than happy to assist you in all of your shower bench needs. Please feel free to contact us to let us know how we can help. We have a variety of shapes and sizes to match your individual shower bench needs. Made from a high density polystyrene, these benches are made to withstand over 600 lbs of pressure. One of our benches can be put in new or existing showers in under an hour, and makes the perfect centerpiece for your luxurious bathroom. The shower benches are ready for installation in an existing shower or in new shower construction. Polystyrene shower benches are durable and can withstand over 600 pounds of pressure. Landlords and property managers, order multiple units and save. Convert all the showers in your properties to easy shower benches. Great for the elderly, handicap or anyone who desires an attractive and durable seat or bench in the shower. Shower curbs and sills are also available. Contact us today for questions or to order your Easy Shower Benches today!